Happy 2012 from Honey Pie! Happy New Year to you all! I haven't posted anything in such a long time I've decided to do a brief timeline in photos of what we've been up to since the summer. On the right is a bee tree. The kids and I saw this when we were on the Terry Fox run in Milford. 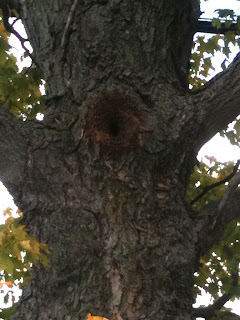 These are honey bees living in a tree just like in a story book. On the left is a honey bee gathering nectar from the goldenrod flowers. This is one of their main sources of nectar and pollen in the late summer and fall. The end of summer is the time to harvest and dry as many herbs as we can. We use a lot of mint in our herbal teas. This basket is one of many we harvested and dried this year. We made a pitcher of fresh mint tea after harvesting as much as we could carry. This is me in our booth at Milford Fair in September. It was a beautiful busy day for us. My honey man was playing the big drum in the parade, I helped judge the art competitions, and we set up our tent with our wares. Luckily for us we had Nana to help keep track of the kids and we started the day off right with pancake breakfast at the fair. At some point I found time to do my first painting in ages. It was a donation for a fundraiser for the Regent Theatre in Picton. I worked from a photograph I took of a honey bee on a poppy. I usually work from life but in this case a photo was the way to go. It's oil paint on plywood. It's very small - I think a foot square. 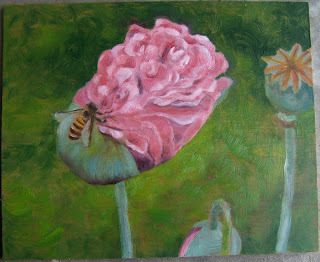 I was so happy to be painting again, I think I'll use some more of my bees on flowers photos and make a whole series. We grew a lot of dry beans this year and had so much fun shelling them and sorting them into jars. This kind is called molasses face. The kids would often come home from school and sit down on the floor and start working on the beans. Once Hazel looked up at me while I was explaining something to her and said, "Actually, I prefer silence while I'm shelling beans Mama." While not a very beautiful photo, this is very exciting for us. These are the first of many experiments in mead making. We used a fun and easy recipe for grocery store mead from here. While the one on the left seemed to be fermenting the slowest it turned out to have the best flavour when we tasted it over Christmas. It was made with our Tea Party tea mixed with honey. The herbs in the Tea Party tea are elder flowers, sumac and red clover. Now we want to try all the teas as mead. Most of our time in the fall was spent getting ready for the One of a Kind Show in Toronto. This was our third year having a booth at their Christmas show. It was a real marathon - 11 days long - but worth it in the end. We managed to have fun and stay healthy through the whole show! Dressing up helps a lot. Here's my family with our Christmas tree. We went on a long walk and after much discussion as to it's merits selected this tree. Consensus with children can be exhausting but very worthwhile. We were all delighted with the tree and it was declared 'the best Christmas tree ever'.